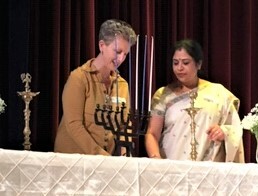 Suchitra Srinivasa helping Rabbi Symons to set up the Menorah flanked by two traditional Hindu oil lamps. years of age and six were over 75. The theme of the event was Unity in Diversity, based on the Hindu axiom Vasudhaiva Kutumbakam (The whole earth is one family). Coming in the wake of the killings in a synagogue, the theme was poignant. The participants were Rev. Liddy Barlow (Christian Associates of Southwest Pennsylvania), Mr. Wasi Mohamed (The Islamic Center of Pittsburgh), Mr. Joshua Sayles (The Jewish Federation of Pittsburgh), Shri Som Sharma (Ahinsa), Rabbi Barbara Symons (Temple David), Acharya Vivek (The Chinmaya Mission), and Rev De Niece Welch, (Pittsburgh Interfaith Impact Network). Two traditional Indian oil lamps flanking the menorah set the mood for the gathering at the temple auditorium. 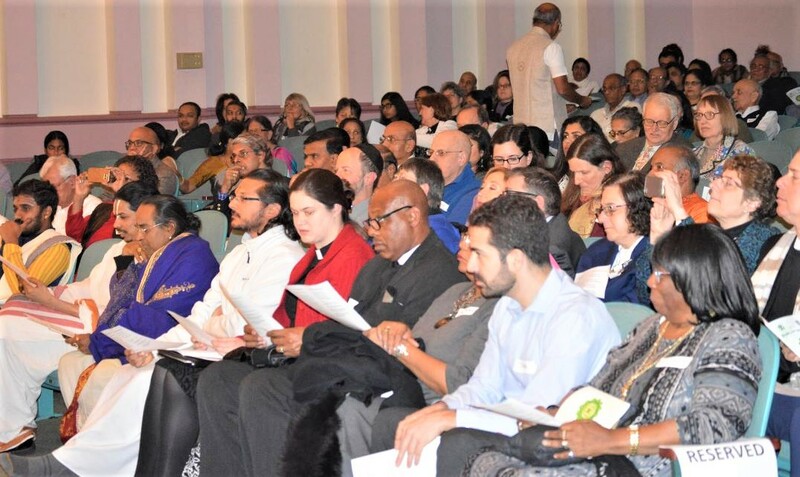 The priest Shri Venkatacharyulu lit the Indian lamps to begin the meeting, as Barbara Symons solemnly read the names of those killed in the shooting spree at the Squirrel Hill synagogue, following which Hindu priests recited Shanti Mantras. The English translations of the mantras were projected on a screen so that the invited guests and the audience could internalize the lofty messages of the mantras. This was a welcome change. Next Harichandan Mantripragada conducted a brief session of traditional meditation to focus our thoughts on bringing peace within us. Since it was Hanukkah, members of the Jewish faith lit the menorah amid Jewish prayers in Hebrew. It was a profound moment for the audience to listen to Hebrew prayers and Sanskrit hymns for the peace. Many members of the various faiths gave messages of peace and unity. The Rev. Liddy Barlow gave a Christian reading emphasizing that we do not have to be identical to coexist. The gathering for the event at the auditorium. Som Sharma, who for several decades, represented Hindus in many interfaith gatherings inour area, drew on the universal teachings of the Isavasya Upanishads and the Hindu tenet that all streams of the various faiths ultimately lead to Brahman or the Supreme One. The Rev DeNiece Welch echoed the same theme from the Christian perspective: since we are created in God’s image, we should find His likeness in all the differences we find among all of humanity and hence never give into hatred. Acharya Vivekji addressing the gathering summarizing the highlights of other speakers. never ever forget his experience of celebrating Hanukkah at a Hindu temple with people of all faiths in attendance. The hateful events leading to the mindless carnage of the innocents at the Tree of Life may still happen again in other places, he said. But it has brought all of us together in support, so we can become strong again, he said, thus showing us a silver lining in an otherwise mass of dark clouds. Chinmaya Mission’s Acharya Vivek, who came from Niagara, Canada, spoke last and summed up the key points of all the speakers who preceded him. 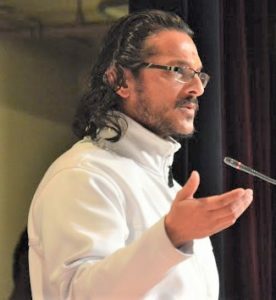 He emphasized that individuals working together to understand each other help to remove ignorance and eliminate blind hatred that ends in violence like that happened at Tree of Life. Law enforcement officials from the Penn Hills and Monroeville municipalities were present at the gathering. Doug Cole, Monroeville municipality’s Chief of Police, told the audience that events like this go a long way to bring communities together. This entry was posted on January 19, 2019, 12:35 pm and is filed under January 2019, Past issues. You can follow any responses to this entry through RSS 2.0. You can skip to the end and leave a response. Pinging is currently not allowed.